DARPA’s Request: To develop a drone platform that could traverse an obstacle course at 60mph for 10 minutes. One more thing, this drone also had to carry 100 pounds. The test flights took place on Friday, May 12, 2017. California Institute of Technology, working with Skylift Global, successfully accomplished the mission, they were the only team to do so. Caltech’s Request: To develop a lightweight and compact drone that could travel at 60mph for 10 minutes, a platform that Caltech would enhance to traverse an obstacle course completely autonomously as part of a demonstration to DARPA. 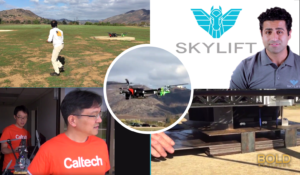 This was Skylift’s second time developing a high-performance drone for Caltech. The previous carried 100 pounds for 2 miles – a proof of performance on Skylift’s efficient heavy-lift capabilities as the vehicle itself weighed 100 pounds. The DARPA demonstration took place on Friday, May 12, 2017. Although not competing in the previous days’ competitions, the vehicle Caltech, JPL, and Skylift developed successfully completed the obstacle avoidance circuit; they were the only team to do so without a crash. Caltech reached out to Skylift just two weeks before the trial date. The team had to design and build the platform to the DARPA specs in record time. Working around the clock, Skylift and Caltech came together to accomplish the task. “It was a combination of factors that made us successful,” said Amir Emadi, CEO and Founder of Skylift. 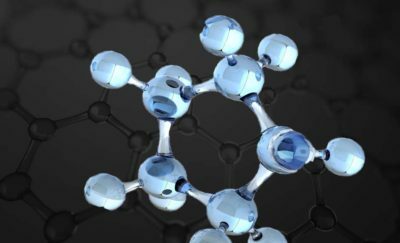 “First we had the Caltech resources and team, then we had our platform which was already under development. But, we also had Reza Nemovi, who is an elite radio control helicopter pilot. He spent the most time with the Caltech team, testing and tweaking the design to make sure it worked as planned. They were working around the clock right up until Friday morning. 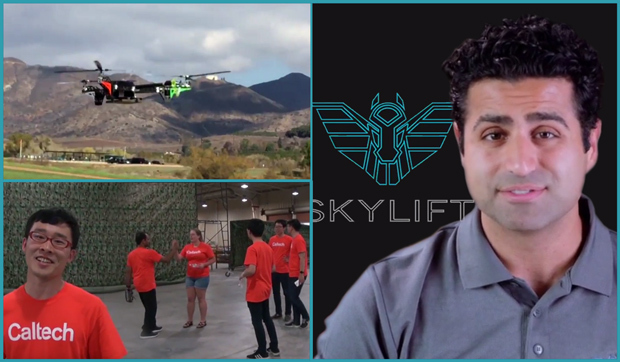 Skylift is developing drones for the crucial ‘last mile’ delivery sector. Their Atlas prototype drones lift well beyond their own weight. The Atlas has been proven at 100-pound payloads; their next lifting challenge is to test that 100-pound vehicle with 400-pound payloads. Eventually, the team at Skylift plans to deliver a prototype that can carry 100 kilograms, 100 kilometers. The ability to carry the heavier weight means that Skylift will be able to deliver a wider range of products, including those which require refrigeration, such as food and medicine. It also allows the Atlas to deliver multiple packages to various locations in one launch. Heavier payloads are important to the future of drones. “I didn’t know what to expect in all of this,” Amir said. “It was really all over the place, limited information, trickling in day by day and working as fast as possible. Two things stood out for me, the fact that DARPA was so impressed that we pulled this off in two weeks. It was proof that private industry at the startup level, working in conjunction with an institution at JPL and Caltech’s caliber can outperform either one on its own or anybody in the industry. Skylift Global is headquartered in San Diego, California. They aim to empower everyone with flight-enabled solutions, by building the safest, most reliable and lowest cost-per-mile heavy-lifting aerial vehicles. Check out more exclusive Bold coverage on drones. AC Motor VS. DC Motor: Which One Is Better For EVs?